The key utensil for making chewy caramels is a candy thermometer, as it's the only way to control the temperature of the sugar. A few degrees too high and the candies become hard. On a recent trip to San Antonio, we discovered these delicious Texan Pecan praline specialties. We brought a lot of boxes home but unfortunately they disappeared fast. Whenever my father-in-law or my husband come back from a trip to San Antonio, they bring back a boxes of the wonderful Texan delicacies. My mother-in-law always asks: "Honey, did you bring home my "magazines" from your business trip?" She refers to them as magazines because if the kids hear that there are caramels in the house they gobble them up right away. This recipe is the result of several attempts to make the candies at home. 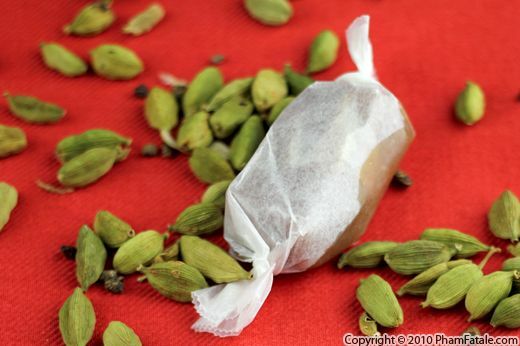 To add my own touch, I flavoured the caramels with cardamom which pairs incredibly well with the crunchy roasted pecans. Until my father-in-law or my husband go back to San Antonio for their work, our family can enjoy these homemade caramels; they're perfect for the holidays! 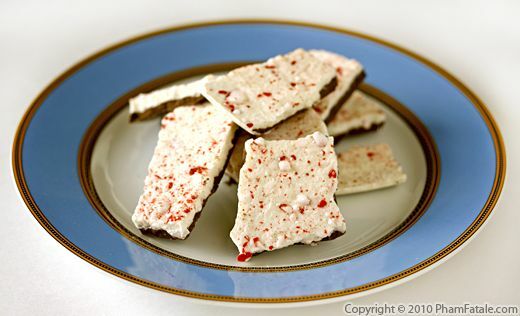 Peppermint bark is my husband Lulu's favorite Christmas candies. We usually get it from the store, but this year I thought it would be a nice touch to make it at home. 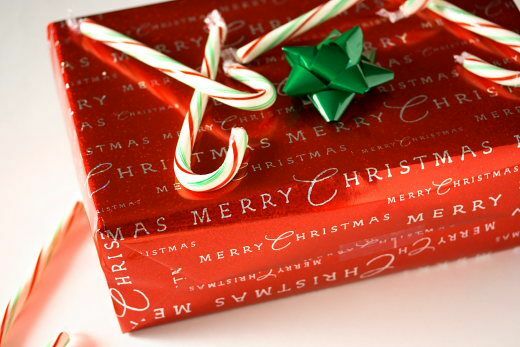 It’s an incredibly simple recipe and makes a great gift. I made a large batch and hid the most of it from Lulu so that I can distribute it to friends and family. To prepare peppermint bark, all you need to do is melt two kinds of chocolate and add a sprinkle of crushed candy canes. I made this with the traditional candies, but you could be more creative and replace the peppermint candy canes with chopped nuts, crushed pretzels, crushed cookies (such as ginger snap cookies) or other candies such as M&Ms or even chopped peanut butter cups. The possibilities are endless. Since I got married, I've discovered a lot of Indian dishes. My father-in-law (I call him Daddy) has introduced me to many new, exotic, Indian foods that were unfamiliar to my palate. Today, Daddy had me try a new Indian confection. When I tasted it, it immediately reminded me of the Vietnamese equivalent called kẹo mè xửng Huế, except that the candies contain rose water, whole cardamom pods, dates, poppy seeds, pistachio, cashew nut and almond. These ancient sweets are called pâte de fruits "maison". "Maison" means house in French. 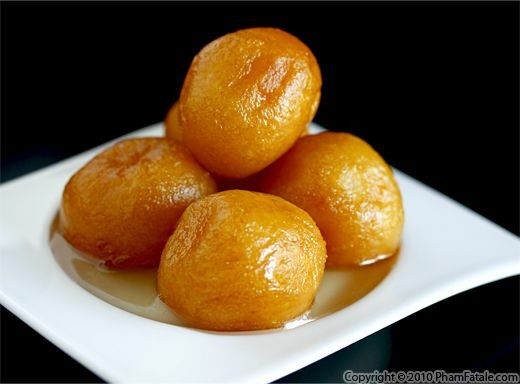 The candies are very easy and require only a few ingredients: fruit pulp, pectin and sugar. The flavor is similar to fruit leather, but with a softer texture. I made strawberry fruit purée and added fresh loquats as well. The key is to use freshly picked, extremely ripe, naturally sweet fruits to ensure optimum flavor. 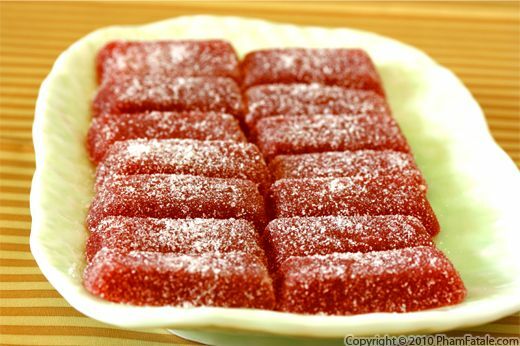 Once the fruit pulp is cooked, you'll need to air-dry the candies for at least 12 hours, cut them and roll them in sugar. 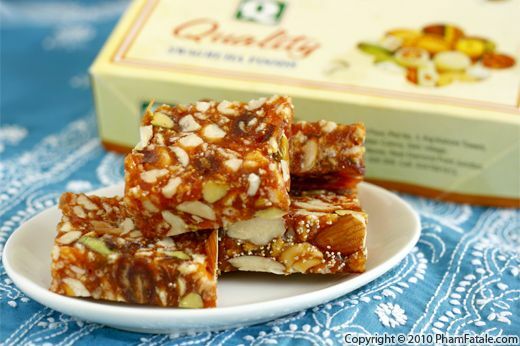 The texture should be soft and the taste should be fruity, without being overly sweet. I usually make these candies when I have very ripe fruits in the garden. You could make them from any fruit purée, such as blackberries, quince, blueberries, cherries, lemon, gooseberries, cantaloupe, peach or plum. Let your imagination run wild! 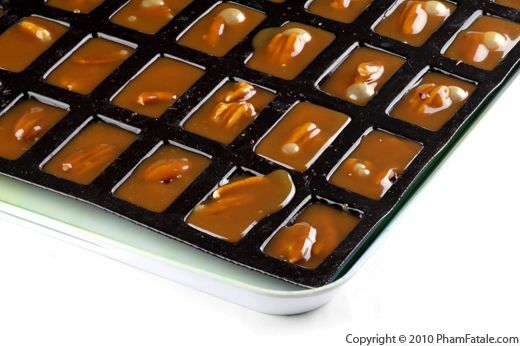 I've always found making homemade candies so much fun because of how flexible the recipes are. These "mignardises" (pretty, delicate sweets in French) are delicious to take to a picnic or as homemade gifts. That is, if you don’t finish them off first!